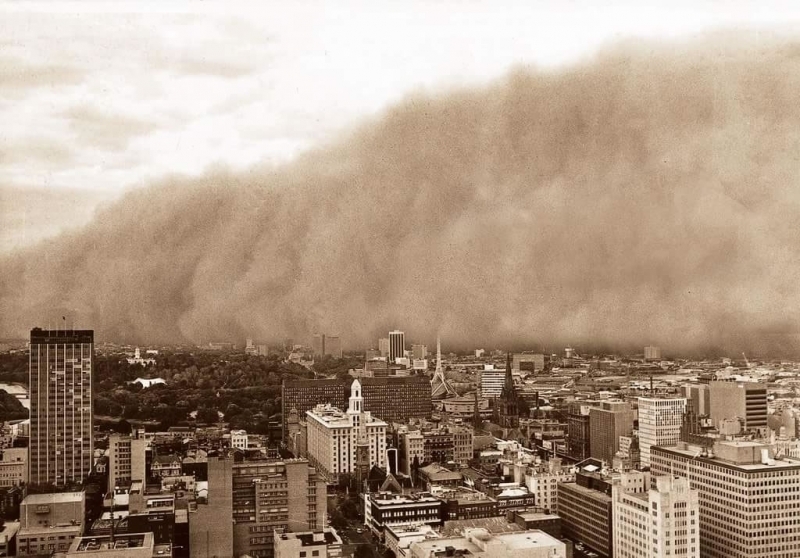 Everyone who was there remembers the dust storm that blew over Melbourne on the afternoon of Tuesday, 8th February 1983. A huge dust storm bought Melbourne to a halt, dumping a thousand tonnes of red soil, sand and dust from central Victoria and South Australia. Only 8 days later, Victoria was devastated by the Ash Wednesday Bushfires. I was working in a building opposite Doncaster Shoppingtown high on Doncaster hill that had a clear view looking west over the eastern suburbs of Doncaster, Box Hill, Bulleen, Kew, Richmond and the city of Melbourne. I remember being called to a top floor office to look at something. On arriving at the office, a number of staff were standing at the window gazing at the horizon. Still a long way into the distance was a wall of dust that went from the horizon up to the sky. I clearly remember feeling anxious, not sure what I was seeing. The 1983 Melbourne dust storm was a meteorological phenomenon that occurred during the afternoon of 8 February 1983, throughout much of Victoria, Australia and affected the capital, Melbourne. Red soil, dust and sand from Central and Southeastern Australia was swept up in high winds and carried southeast through Victoria. The dust storm was one of the most dramatic consequences of the 1982/83 drought, at the time the worst in Australian history and is, in hindsight, viewed as a precursor to the Ash Wednesday bushfires which were to occur eight days later. In 1982-83, El Niño brought exceptionally dry conditions to almost all of eastern Australia, and in Victoria's Mallee and northern Wimmera 1982 was the driest or second driest year on record. As vegetation dried off late in 1982, the topsoil was loosened, ready to be blown away by any reasonably strong wind. By late summer there had already been numerous small dust-storms in northwestern Victoria. Late on the morning of 8 February 1983 a strong, but dry, cold front began crossing Victoria, preceded by hot, gusty northerly winds. The loose topsoil in the Mallee and Wimmera was quickly picked up by the wind, and as the front moved east, the soil collected into a large cloud oriented along the line of a cool change. At Horsham, in western Victoria, raised dust could be seen by 11am; by noon it had obscured the sky. In Melbourne, the temperature rose quickly as the north wind strengthened, and by 2:35pm it had reached 43.2°C, a record February maximum. A short time later, a spectacular reddish-brown cloud could be seen advancing on the city, reaching Melbourne just before 3pm. It was accompanied by a rapid temperature drop, and a squally wind change strong enough to uproot trees and unroof about 50 houses. Visibility plunged to100 metres, and according to witnesses 'everything went black' as the storm struck. The worst of the dust-storm was over by 4pm, when the wind-speed dropped rapidly. At its height, the dust-storm extended across the entire width of Victoria, and was many kilometres across. The dust-cloud was some 320m deep when it struck Melbourne, but in other areas extended thousands of metres into the atmosphere. It was estimated that about 50,000 tonnes of topsoil were stripped from the Mallee (approximately 1,000 tonnes of it being dumped on the city), leaving the ground bare, and exacerbating the effects of the drought. Open water channels in the northwest were clogged with sand and dirt. The combined effect of drought and dust-storm inflicted damage on the land that, according to the then President of the Victorian Farmers and Graziers' Association, would take up to 10 years and tens of millions of dollars to repair. Aired on channel 10's eyewitness news Melbourne. 8th February 1983.